Interim tag is removed on the former Morgan State head coach. Alabama State has decided to remove the interim tag from Donald Hill-Eley and make him the full-time head coach for the Hornets. He was introduced as the school’s 29th Head Coach at a press conference on Thursday afternoon in Montgomery. Hill-Eley had been the interim coach since October 6, after ASU parted ways with Brian Jenkins who started the season 0-5. Hill-Eley spoke of his players during the news conference, “Those are my guys, to see those guys matriculate through that 0-5 start and see the resilience in those guys. To see them go from dropping a ball to catching a ball, it just has been a remarkable thing,” he said. Hill-Eley rallied the Hornets to a 5-1 record in the final six games, finishing 5-6, which included a win in the Magic City Classic against rival Alabama A&M. The only loss was to eventual SWAC Champion Grambling State, however, the Tigers went unbeaten in conference play all season long. To be fair four of the wins came against SWAC teams with a combined 11 wins, and the other win was against an NAIA team. But they won none the less. 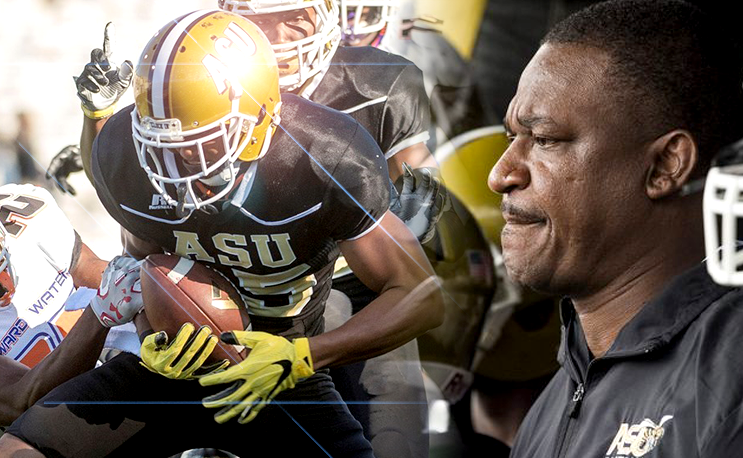 Hill-Eley has been at Alabama State for three seasons now, after coming over from a one-year stint with Norfolk State. Hill-Eley spent 12 years as head coach at Morgan State and ranks third all-time in Bears’ history with 59 wins. The Virginia Union graduate also spent four years as an offensive coordinator at Hampton in the late 1990s.